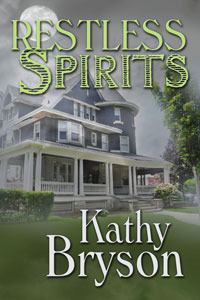 Saving The Book Tart – Guest Post by Kathy Bryson + Excerpt from Restless Spirits + Contest! I’m dealing with mountains of boxes and trying to blend my life with my Bookstore Beau now that I’ve moved to Colorado Springs and deal with contractors and insurance adjusters to get our home repaired! I am so grateful for the help of the book community and all the authors and readers who have helped me smile and just keep breathing. Kathy Bryson definitely made me smile! When I read about your adventures, Kat, with popcorn ceilings and insurance companies, you had my complete sympathy. Been there, done that! When I bought my house, it was newly renovated, but all the faucets broke the first month. I moved there from a condo where rats had set up housekeeping in the walls, but no one could decide who was responsible. These were both a step up from renting. My first apartment was cheap in a run-down neighborhood, and the kitchen sink fell off the wall during Thanksgiving dinner. To this day, I can’t look at turkey without picturing ants swimming. At my last apartment, the police department stopped taking calls because they had so many complaints. The owner was fighting with the city over garbage pickup, and again, there were rats involved. Naturally, I channeled all this experience into my writing (and got a cat). Renovating your characters’ homes is the ideal way to decorate while avoiding fuss and expense! After all, what could possibly go wrong converting a hundred-year-old, former hospital into a bed and breakfast? Cue the sinister laughter! In Restless Spirits, Marilee Harper finds electricity and plumbing are the least of her worries. Her usual practical directness doesn’t always succeed while working with a cook who channels Elvis, contractors who act like paparazzi, and her difficult mother. Sometimes you bring your troubles with you. Then the haunting goes too far! Now my advice won’t necessarily help because after all, you’re the one living through this. But for what it’s worth, I suggest concentrating on what’s broken first. The rest will follow in good time. Always get multiple estimates, and always take breaks. Walking away for a good dinner and cold drinks will help! On the plus side, you got that popcorn ceiling down. I could never find a contractor willing to do that! And if it should turn out to be more than asbestos, I have the email of some really good psychics. John commented on the décor when he stopped by after school. I stood up from painting the wood paneling where it met the inside of the staircase, stepped back to check my work, and bumped into him. “It looks nice,” John said simply, catching my elbow and steadying me. “Thanks.” I smiled at him. Standing one step up, I was eye level with John. It was a potentially intimate moment, and I watched him carefully to see some spark of interest, but I was disappointed. He examined the stairwell, frowning, and didn’t seem aware of me at all, but his next statement seemed genuinely remorseful. I studied him more closely. John had recovered from his earlier fall, but he looked pale and thin. Tiny frown lines were etched between his eyebrows, and there was a drag along the lower line of his jaw that worried me. John shook his head. “I did, I did. I used my lunch hour to call the bank . . .” His voice trailed off and he looked away, anywhere but at me. “Muh empoyee’s pin shin’ ma shin,” John mumbled while his eyes laughed at me. I let go with a little slap. So much for a professional relationship. “I didn’t use your bank. I used a national chain at the county seat.” John looked embarrassed at my shocked expression. “Well, I’d just moved here and I didn’t know anyone, but the property was too good a deal to pass up, and . . .” His voice trailed off as he lifted his hands in confusion. “It’s okay.” John grinned and leaned into me. “It’s embarrassing, really. I’m a mathematician. I thought I’d covered this.” Then he straightened up and stood transfixed, looking over my shoulder. I turned to see what he watched and became aware of a low thumping sound growing louder and faster. A ball rolled into view at the top of the stairs, seemed to hesitate for a moment, and then gaining momentum, hurtled down the stairs. Then suddenly behind it came balls of all shapes and sizes, all thundering down the steps in a rolling, bounding, bouncing wave of athletic enthusiasm. John looked warily from me down the stair and back again. “Hey, you were the one who told her she could decorate,” I added, but gently. I didn’t know quite how to react. I didn’t actually believe in ghosts or whatever. I would have said a haunted house wasn’t possible, but an avalanche of athletic spheres had just thundered past. However, since it seemed to have missed the wet paint, I would not panic and assume anything bad was happening in the house. Previous PostPrevious Saving The Book Tart – Guest Post by Maggie Kaye + Spotlight on So Right With You + Contest! Next PostNext Saving The Book Tart – Cover Reveal for Aven Ellis’ Chronicles Of A Lincoln ParkFashionista + Contest!